At CES this year, we got a good look at Samsung's ideas on bringing curved display technology to consumer monitors. Ten months later, the company is ready to release its first one, boringly named "SD590C." But its run-of-the-mill branding doesn't carry over to its design. 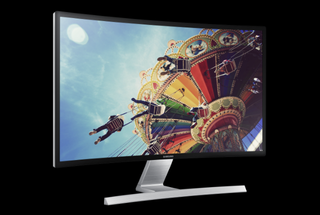 Unlike other monitors, the SD590C comes with a "curved design that was carefully engineered to draw you into the display," according to Samsung VP Ron Gazzola in a press release. Whether those praises are actually founded is uncertain, though our early prototype hands-on left us a little underwhelmed. The panel is a 1920x1080 LED screen (with a VA panel) that could look a little sad next to QHD and 4K displays currently spilling out from manufacturers. Because of its uncommon curves, physically bringing the edges closer to gamers' eyeballs, Samsung says the display is optimized for an immersive gaming and entertainment experience but can also benefit average office workers parked in front of their monitors from 9 until 5. The curved edges, allegedly, require no need to shift your focus just to see the edge of the screen. But the reason Samsung is confident in its gaming appeal is because of its dual-channel stereo speakers onboard, its 350 nit brightness, and a built-in gaming mode, which "intelligently detects changes in scenes, enhances the color, and alters the screen's contrast to make the darks darker and the lights brighter." Game Boost applies that same tailored approach to games only with sound by tinkering with equalizers for better effects along with other audio adjustments.